Let’s fry up some pork chops. 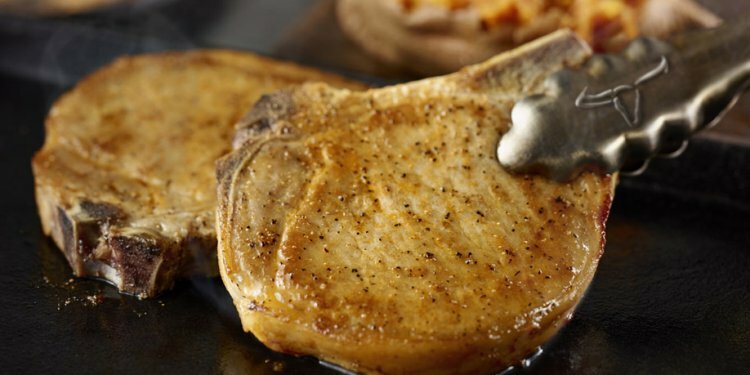 Okay, if rocket science were people, these pork chops would be…Antarctica. These are the simplest, most delightful little numbers—ready in 5 to 10 minutes, flavorful, and exceedingly man-pleasing. And again, I don’t intend to be a walking, breathing affront to feminism with statements like that. It just so happens that I am a raging feminist. I believe in raising my daughters to be creative and confident women who can find equal contentment standing on their own two feet or raising a family with a man, if he’s the right match. I believe in equal opportunities for men and women, and I believe that women can do anything men can do. Except that lumberjack stuff. That would be pretty tough. I also believe that a woman can be strong and independent while also deriving joy from watching a huge grin sweep across her husband’s face when he bites into something he finds delicious. My Lord, can I ever write the worst recipe headnotes. I should be fired. Plate #1: Flour…seasoned salt (any seasoned salt will do; I use Lawry’s. )…cayenne pepper, if you’ve got the guts. Plenty of ground black pepper. Stir it together with a fork until it’s nice and combined. Next comes plenty of ground black pepper. Again: no freshly ground tri-color peppercorns will do here. We need the black dust in the can. Here’s the deal: I’m a lazy person. And as a lazy person, I just can’t be bothered with painstakingly seasoning both sides of every pork chop in a batch before moving forward. So I just season one side, then plop it, seasoned side down, onto the flour mixture. Then salt and pepper the other side. And place them on a clean plate, which I think at this point would be Plate #3 or Plate #33 or Plate #3, 333, 333 or something. Now heat 1/2 cup canola oil in a large skillet, preferably a nonstick skillet that’s lost a lot of its nonstick coating. Not really. I don’t recommend that. It’s just that if you had one of those, too, I’d feel much better about myself. Add 2 tablespoons butter to the oil. This’ll help the pork chops achieve a nice golden brown color, and some added flavor too. Make sure the oil’s hot (medium heat), then add three pork chops to the skillet. Let them cook and sizzle and cook and sizzle. Cook on the first side for 2 to 3 minutes. I watch the edges of the pork chops; I want them to get pretty golden brown before I flip them over. Then flip ’em over! I use clean tongs for this, because raw pork grosses me out the door. Cook the second side for 1 to 2 minutes. You definitely want the meat done all the way through, but since they’re so thin it doesn’t take long! When they’re done, remove the pork chops to a paper towel-lined plate. Repeat with the other pork chops till they’re all done. And sure, you could throw in some bacon and chives…but that would take more energy than I’m willing to expend.